Why is there a need for standards? As more and more publishers, funders and institutions start to look to altmetrics to provide additional insights about the reach and influence of their work, it’s important that everyone can understand where these data come from and how they are maintained. The impetus to be transparent about how the data are collected and presented sits with altmetrics providers, of which Altmetric is one. Beyond supporting best practices (such as those laid out in the Leiden Manifesto) we’re committed to providing the best possible quality data, and to being transparent about how it is collected and displayed. In June 2013 the Sloan Foundation awarded NISO (the National Information Standards Organisation) a grant to undertake a two-phase initiative to explore, identify, and advance standards and/or best practices related to a new suite of potential metrics in the community. 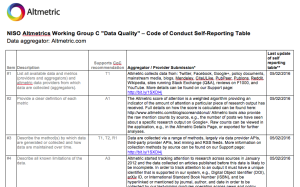 Altmetric’s Founder Euan Adie and Product Development Manager Jean Liu were part of the working groups convened by NISO to formulate proposed codes of conduct for altmetrics data and providers. The groups met virtually over a period of months to determine and agree the scope of what they would recommend, and the draft guidelines and codes of conduct. In September 2016 NISO released the final outputs from the initiative. This working group extensively studied the altmetrics literature and other communications and discussed in depth various stakeholders’ perspectives and requirements for these new evaluation measures. Altmetric Product Development Manager Jean Liu was part of this group. This working group investigated alternative research outputs and application of persistent identifiers in the scholarly environment in order to clearly identify and track research outputs and their relationships. This working group studied and discussed issues of data quality in the altmetrics realm, an essential aspect of evaluation before metrics can be used for research and practical purposes. Altmetric’s Founder Euan Adie was part of this group. The final version of recommended practice from the NISO Alternative Assessment Metrics Project is now available to download here. You can view and download our report here. All Altmetric data is available for any researchers who wish to use it to conduct bibliometrics studies, often resulting in publication or conference presentations. We’re committed to making all of our own publications and supporting data open access – you can find it all on figshare. In 2016 we launched an annual research grant to further studies in the field. In 2015 we launched the Altmetric Ambassador program, and now work closely with a group of over 200 Ambssadors around the world to educate and encourage best practice use of altmetrics. Run as part of our product development activities, we meet virtually and in-person with our independent expert advisory board to ensure we’re developing our tools to best meet user needs. Several external development partners are recruited as beta-testers or development partners for every new product we build. Their feedback is taken on board throughout the development process to ensure everything is done to the highest possible standard.